Fabulous location! Located in historical Old Town just steps from picturesque Lake Ontario, world famous theatres, quaint shops, and wonderful restaurants! Situated right on a park where you can enjoy tennis, swimming, leisurely walks, bicycling, and local fairs. Take in Niagara's Wine Country by visiting local wineries. 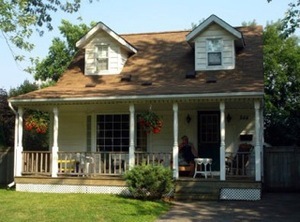 The cottage is cozy and comfortable and has everthing you could need, just bring your food, beverages, toiletries. Two full bathrooms are newly renovated with the upper level bathroom tranquil like a spa. The common area features new gas fireplace, wireless internet and cable TV and a view of the park. Sleeps 5 comfortably with an extra queen bed in the basement if needed. Additional charge will apply to basement bedroom. Please inquire at time of booking. There is a lovely front porch for people watching and a newly refurbished deck in the back yard, complete with seating and dining area. An ideal cottage for family and friends! Rates start at $375.00. Stay tuned for updated photos. Updates in progress at the cottage. 3 night minimum in peak season.